Healing is a multifaceted and intricate process initiated in response to tissue injury that restores the function and integrity of damaged tissues. Wound healing involves continuous cell-cell and cell-matrix interactions that allow the process to proceed in three overlapping phases such as inflammation (0-3 days), cellular proliferation (3-12 days) and remodeling (3-6 months). Several other natural products and medicinal plants enhance the process of wound healing. , The therapeutic benefits of secondary metabolites of plants have also been focused in many investigations. We have been screening topical evergreen plants as agents for wound healing since two decades. Here, we report the efficacy of alcoholic extract of A. calamus on dermal wound healing in rats. A. calamus (Family: Acoraceace) is a perennial plant, the rhizome has many pharmacological activities; the ethanol extract has anticellular and immunosuppressive properties. The rhizomes of A. calamus and their essential oil (calamus oil) are widely used in the flavoring industry and production of alcoholic beverages in Europe. Recent reports have confirmed the presence of several pharmacological components in the alcoholic extract of rhizomes of A. calamus. Recently, the role of ί-asarone, a component of A. calamus, has been reported for its inhibitory effect on adipogenesis in 3T3-L1 cells. Wound healing activity of ethanolic extract of A. calamus leaves has been studied and reported wherein, the wounds were treated with the plant extract in an ointment form and the results were compared with a standard drug, povidone-iodine. However, in this investigation, experiments were carried out to find out the efficacy of ethanolic extract of the rhizomes of A. calamus on wound repair process by measuring various biochemicals, biophysical parameters related to wound healing. Histological evaluation of wounds was also studied to confirm the results. The efficacy of the extract on collagen characteristics has also been carried out. The ratio of Type I/III collagen has also been studied and found out that the alcoholic extract of A. calamus enhances all phases of wound healing. Acrylamide, ammonium per sulfate, bovine serum albumin, calf thymus deoxyribonucleic acid (DNA), chloramine-T D-glucuronic acid and L-hydroxyproline were from Sigma Chemical Company, St. Louis, USA. p-dimethyl aminobenzaldehyde and Folin's Phenol reagent were from Loba Chemie, Mumbai, India. Methyl cellosolve was obtained from Merck, Darmstadt, Germany. All other reagents were high analytical grade. The rhizome of A. calamus obtained locally were minced, weighed, powdered and homogenized in 10-20 volumes (by weight) of 70% ethanol and filtered to yield a viscous supernatant. This was used as the crude extract. An aliquot of the extract was lyophilized and weighed. About 75% by weight of the starting dry material was recovered in this fraction. The lyophilized powder was reconstituted in phosphate buffered saline (PBS). Male rats of Wistar strain weighing 180-200 g were chosen and divided into two groups of 6 each for the present study. The animals were maintained on clean, sterile, polyvinyl cages and fed with commercial rat feed from M/S Hindustan Lever Ltd., India (mixed with wheat flour in the ratio of 1:1 (w/w)). Food and water were provided ad libitum to the animals. All procedures were carried out according to the Institutional Animal Care and Use Committee. A formal approval from the Animal Ethical Committee of our institute has also been obtained. A 2 cm 2 (4 cm) full thickness open excision wound was made on the back of the rat as reported in our earlier studies. A total number of 48 animals were used for the whole study. The animals were divided into two groups (control and treated), each group containing six rats. Each animal was given a light ether anesthesia and shaved on its back under aseptic conditions. Wound was created with a sterile scalpel as per the rules of Committee for the Purpose of Control and Supervision of Experiments on Animals under sterile conditions. About 200 μl of the plant extract (lyophilized powder reconstituted in PBS at a concentration of 40 mg/Kg body weight) was applied topically on the wounds once daily until the wounds healed completely. The control wounds were treated with 200 μl of PBS. The animals were sacrificed at different time point intervals such as 4 th , 8 th and 12 th day. The wound tissues formed were removed and used for various biochemical estimations. Separate groups of animals, 6 each for control and experiment were maintained to find out the period of epithelialization and rate of wound contraction. 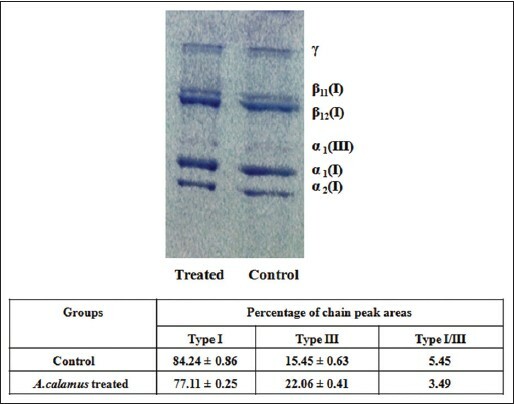 The sub-unit composition of the isolated collagen was investigated by interrupted sodium dodecyl sulfate-polyacrylamide gel electrophoresis (SDS-PAGE. Briefly, collagen bands were separated by SDS-PAGE) using 3% stacking gel with 5% separating gel and Coomassie brilliant blue staining. The rats were sacrificed and tissues in the wound site of the individual animal were removed. These samples were then separately fixed in 10% formalin, dehydrated through graded alcohol series, cleared in xylene and embedded in paraffin wax (melting point 56°C). Serial sections of 5 μm were cut and stained with hematoxylin and eosin and Van Gieson's. The sections were examined under light microscope and photomicrographs were taken. Data are expressed as mean ± SD and the results were statistically evaluated using Students paired and unpaired t-test and nonparametric Mann-Whitney test. All statistical analyses were executed using GraphPad Prism (version 5.0; GraphPad software Inc. San Diego CA, California, USA). The biochemical evaluations such as DNA, total protein, hexosamine and total collagen content in the wound tissues of control and treated rats are depicted in [Table 1]. The DNA content was significantly elevated to 46% on day 4 further increased to 60% on day 8 and then decreased. A similar pattern (29% increase on day 4, 34% on day 8) was observed in protein content also. The collagen content was 43% on day 4, which further rose up to 73% for day 8 and then reduced to 66% on day 12. Level of hexosamine in the wound tissues of treated rats was also elevated by 34% on day 4 and decreased to 16% and 15% on day 8 and 12 respectively. 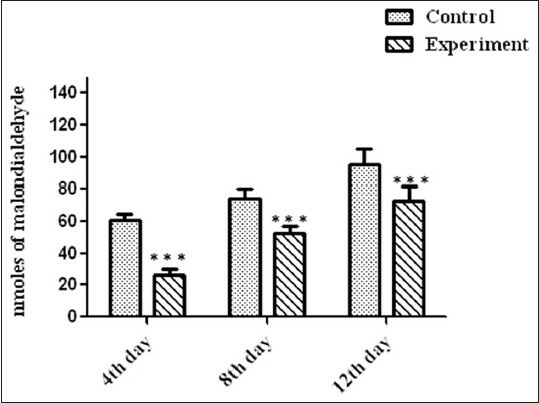 [Table 2] and [Figure 1] show the percentage wound contraction on various days of control and A. calamus treated rats on different days. Wounds that received A. calamus extract contracted a very fast and healed completely by day 14 whereas, the control wounds took 21 days for complete healing [Figure 2]a]. [Figure 2]b illustrates the tensile strength of control and treated wound tissues measured on day 10. There is more than two fold increase in tensile strength in the A. calamus treated wounds. [Figure 3] imparts levels of lipid peroxide in control and treated rats. A. calamus treated rats showed lower free radical levels and oxidative tissue damage (as represented as malondialdehyde level) than control. 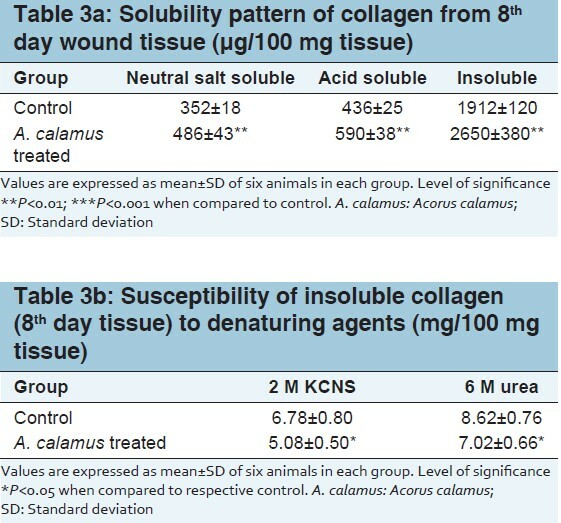 Solubility pattern of collagen and susceptibility of insoluble collagen in denaturing agents are depicted in [Table 3]a and b. There is about 39% increase in the insoluble collagen in A. calamus treated wounds, which confirm that collagen is more cross-linked than the collagen from control wounds. Similarly, when the susceptibility of insoluble collagen to denaturing agents was measured in the presence of 2 M KCNS and 6 M urea, there was about 33% and 22% decrease respectively in the A. calamus treated wound collagen further confirming the increased cross-linking of collagen. The histological examination displayed that the tissue regeneration was much faster in the A. calamus treated rats. On day 4, less number of cellular infiltration and proliferating blood capillaries was observed along with lesser fibroblasts in control wound tissue [Figure 4]a]. Whereas, A. calamus treated wound tissue showed increased fibroblasts and macrophages with reasonable collagen fibers. 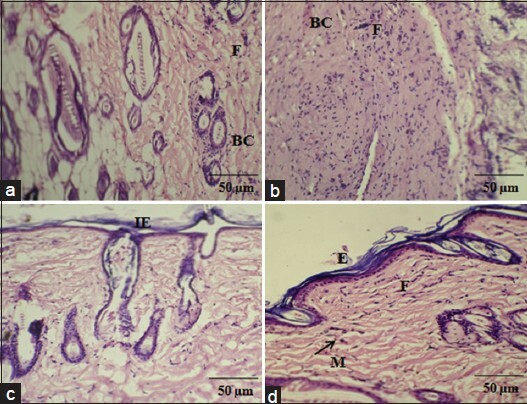 Budding of new blood capillaries in wound tissues and prominent re-epithelialization were also detected in A. calamus treated wound tissues [Figure 4]b]. On day 8, in control, irregularly arranged collagen fibers and less fibrosis could be seen with incomplete epithelialization [Figure 4]c]. But A. calamus treated wound tissues showed complete epithelialization, increased fibrosis, uniform thick collagen deposition and macrophages at the wound site [Figure 4]d]. [Figure 5] shows the interrupted SDS-PAGE pattern of acid-soluble collagen of wound tissues. A significant increase in the α1 of type III collagen could be observed in the A. calamus treated wounds. Wound healing is a complex natural renewal process of skin cells to curtail or eliminate scarring as well to help healing and repairing damage. The major events include cellular migration, proliferation, adhesion and phenotypic differentiation. The present investigation of A. calamus administration on wounds has produced a positive outcome in the healing process. Plant products are potential agents for wound healing and are mainly chosen because of their extensive availability, non-toxicity, ease of administration, absence of unwanted side-effects and their efficiency as crude preparations. A. calamus is widely used as traditional medicine by various cultures world-wide, although applications vary by region. , In this study, we have evaluated the efficacy of the alcoholic extract of the rhizomes of A. calamus on wound healing in rats. The increase in DNA and total protein content in the treated wounds reflect mitogenic potential of A. calamus extract and hyperplasia of the cells. Hexosamine is the matrix molecule, present in the extracellular matrix, which acts as the ground substratum for the synthesis of new collagen scaffold. The early increase in hexosamine shows the active synthesis of ground substratum by fibroblasts on which collagen is laid down. The elevated level of hexoasamine in treated rats could provide a strength to regenerated tissues. Collagen deposition is an another important event in the wound tissue formation. The healing process depends to a large extent, on the regulated biosynthesis and deposition of new collagens and their subsequent maturation,  which was also increased by A. calamus treatment. Appropriate healing of wounds is a crucial event for the renovation of disrupted skin for its normal functional status. Higher rate of wound contraction in A. calamus treated rats might be attributed to increased proliferation and transformation of fibroblasts into myofibroblasts. This could be attributed by the enhanced contractile property of myofibroblast resulting in the shorter epithelialization period. Histological findings firmly substantiate the increased proliferation of fibroblasts and reepithelialization in A. calamus treated rats. 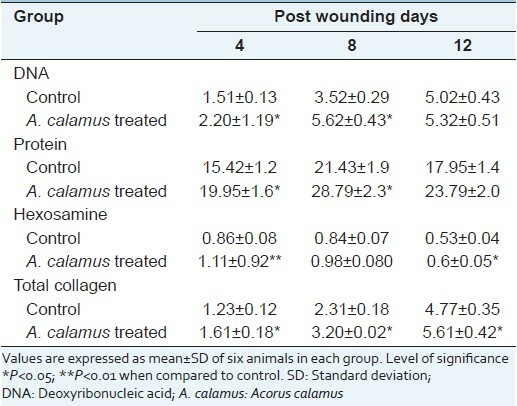 Evaluation of collagen content in wound tissues of control and A. calamus treated wounds, obviously confirms that A. calamus promotes collagen synthesis and deposition. The increase in solubility of collagen is relative to the synthesis of new collagen and leads to greater potential for cross-link formation. Thus, the increased solubility and decreased susceptibility of insoluble collagen in treated wounds, strongly substantiates that A. calamus accelerates the collagen synthesis, then maturation and cross-linking. The increase in tensile strength of treated wounds could be due to the increase in the collagen concentration per unit area and stabilization of the collagen fibers. The early tissue deposition and increased tensile strength may be contributed by terpenoid constituents of A. calamus. Reactive oxygen species are noxious to wound healing process due to their damaging effects on cells and tissues. The increase in free radical production and diminished antioxidant activities may worsen the condition and account for the delay in healing. A. calamus enhances wound healing by reducing the level of free radicals and hence the oxidative damage. Thiem and Goślińska  have reported that the topical administration of compounds with free radical scavenging properties in patients have shown to improve wound healing significantly and protect tissues from oxidative damage. Topically administered drugs are effective in faster wound contraction and healing due to the larger availability of the drug at the wound site. Hence, the rate of wound contraction in treated rats was considerably higher. Furthermore, the period of epithelialization was shorter in the treated wounds. These results firmly support the feasible and productive approach of A. calamus in dermal wound healing. Topical administration of A. calamus accelerates wound repair, which involves different steps such as collagen synthesis and maturation, wound contraction and epithelialization. These results firmly support the feasible and productive approach of A. calamus in dermal wound healing in rats. The authors would like to thank the Director, CSIR-Central Leather Research Institute for the facility provided. T. Ponrasu and M. Ganeshkumar acknowledge Council of Scientific and Industrial Research (CSIR), New Delhi, for the award of Senior Research Fellowship. 1. Kumar B, Vijayakumar M, Govindarajan R, Pushpangadan P. Ethnopharmacological approaches to wound healing - Exploring medicinal plants of India. J Ethnopharmacol 2007;114:103-13. 2. Gallo RL, Bernfield M. Proteoglycan and their role in wound repair. In: Clark RA, editor. The Molecular and Cellular Biology of Wound Repair. New York: Plenum Press; 1996. p. 475-92. 3. Karodi R, Jadhav M, Rub R, Bafna A. Evaluation of the wound healing activity of a crude extract of Rubia cordifolia L. (Indian madder) in mice. Int J Appl Res Nat Prod 2009;2:12-8. 4. Sumitra M, Manikandan P, Gayathri VS, Mahendran P, Suguna L. Emblica officinalis exerts wound healing action through up-regulation of collagen and extracellular signal-regulated kinases (ERK1/2). Wound Repair Regen 2009;17:99-107. 5. Ozgen U, Ikbal M, Hacimuftuoglu A, Houghton PJ, Gocer F, Dogan H, et al. Fibroblast growth stimulation by extracts and compounds of Onosma argentatum roots. J Ethnopharmacol 2006;104:100-3. 6. Parab RS, Mengi SA. Hypolipidemic activity of Acorus calamus L. in rats. Fitoterapia 2002;73:451-5. 7. Muthuraman A, Singh N, Jaggi AS. Protective effect of Acorus calamus L. in rat model of vincristine induced painful neuropathy: An evidence of anti-inflammatory and anti-oxidative activity. Food Chem Toxicol 2011;49:2557-63. 8. Dong W, Yang D, Lu R. Chemical constituents from the rhizome of Acorus calamus L. Planta Med 2010;76:454-7. 9. Parap RS, Mengi SA. Evaluation of hypolipidemic activity of Acrous calamus Linn in rats. Indian Drugs 2003;40:25-9. 10. Lee MH, Chen YY, Tsai JW, Wang SC, Watanabe T, Tsai YC. Inhibitory effect of ß-asarone, a component of Acorus calamus essential oil, on inhibition of adipogenesis in 3T3-L1 cells. Food Chem 2011;126:1-7. 11. Jain N, Jain R, Jain A, Jain DK, Chandel HS. Evaluation of wound-healing activity of Acorus calamus Linn. Nat Prod Res 2010;24:534-41. 12. Ponrasu T, Suguna L. Efficacy of Annona squamosa on wound healing in streptozotocin-induced diabetic rats. Int Wound J 2012;9:613-23. 13. Vogel HG. Antagonistic effect of aminoacetonitrile and prednisolone on mechanical properties of rat skin. Biochim Biophys Acta 1971;252:580-5. 14. Porat S, Rousso M, Shoshan S. Improvement of gliding function of flexor tendons by topically applied enriched collagen solution. J Bone Joint Surg Br 1980;62-B:208-13. 15. Burton K. A study of the conditions and mechanism of the diphenylamine reaction for the colorimetric estimation of deoxyribonucleic acid. Biochem J 1956;62:315-23. 16. Lowry OH, Rosebrough NJ, Farr AL, Randall RJ. Protein measurement with the Folin phenol reagent. J Biol Chem 1951;193:265-75. 17. Woessner JF Jr. The determination of hydroxyproline in tissue and protein samples containing small proportions of this imino acid. Arch Biochem Biophys 1961;93:440-7. 18. Elson LA, Morgan WT. A colorimetric method for the determination of glucosamine and chondrosamine. Biochem J 1933;27:1824-8. 19. Santos MT, Valles J, Aznar J, Vilches J. Determination of plasma malondialdehyde-like material and its clinical application in stroke patients. J Clin Pathol 1980;33:973-6. 20. Piez KA. The amino acid chemistry of some calcified tissues. Ann N Y Acad Sci 1963;109:256-68. 21. Adam M, Fietzek P, Kuhn K. Investigations on the reaction of metals with collagen in vivo. 2. The formation of cross-links in the collagen of lathyritic rats after gold treatment in vivo. Eur J Biochem 1968;3:411-4. 22. Hering TM, Marchant RE, Anderson JM. Type V collagen during granulation tissue development. Exp Mol Pathol 1983;39:219-29. 23. Priya KS, Gnanamani A, Radhakrishnan N, Babu M. Healing potential of Datura alba on burn wounds in albino rats. J Ethnopharmacol 2002;83:193-9. 24. Eming SA, Werner S, Bugnon P, Wickenhauser C, Siewe L, Utermöhlen O, et al. Accelerated wound closure in mice deficient for interleukin-10. Am J Pathol 2007;170:188-202. 25. Raghow R. The role of extracellular matrix in postinflammatory wound healing and fibrosis. FASEB J 1994;8:823-31. 26. Sandhya S, Kumar PS, Vinod KR, Banji D, Kumar K. Plants as potent anti diabetic and wound healing agents-A review. Hygeia JD Med 2011;3:11-9. 27. Lee MR, Yun BS, Park SY, Ly SY, Kim SN, Han BH, et al. Anti-amnesic effect of Chong-Myung-Tang on scopolamine-induced memory impairments in mice. J Ethnopharmacol 2010;132:70-4. 28. Gupta A, Upadhyay NK, Sawhney RC, Kumar R. A poly-herbal formulation accelerates normal and impaired diabetic wound healing. Wound Repair Regen 2008;16:784-90. 29. Siegel RC. Collagen cross-linking. Synthesis of collagen cross-links in vitro with highly purified lysyl oxidase. J Biol Chem 1976;251:5786-92. 30. Thiem B, Goślińska O. Antimicrobial activity of Rubus chamaemorus leaves. Fitoterapia 2004;75:93-5. 31. Barnes MJ, Morton LF, Bennett RC, Bailey AJ, Sims TJ. Presence of type III collagen in guinea-pig dermal scar. Biochem J 1976;157:263-6. 32. Bazin S, Delaunay A. Biochemistry of inflammation. VI. Fluctuations in the levels of collagen and nonfibrillar proteins in different types of inflammatory foci. Comparative studies. Ann Inst Pasteur (Paris) 1964;107:163-72.